FlagMag.com - Flag Football Magazine All sorts of flag football information -- tournaments, leagues, flags and other equipment (even a playbook) for sale, Air it Out info, a message board, the list goes on. Take a look for yourself. Run by Jim Zimolka. United States Flag & Touch Football League (USFTL) The governing body for all flag and touch football - men, women and youth. Flag Football Ninja Flag Football Playbooks that Win Championships. Period. Flag Football Ninja sells downloadable, printable 4on4, 5on5, 7on7 and 8on8 flag football playbooks to take you to the playoffs and beyond. For more options, try our "MiPlays" on your iPod or wrist plays. Don't settle for runner up. Start winning more flag football games now. No Mistakes. No Mercy. And now, check out the Ninja's Ultimate Flag Football Blog. The Headache Offense and Unbeatable Defense Jonathan Grant has been selling this exhaustive set of plays, schemes and advice for flag football teams for over 10 years. It's not just a playbook. It's a strategy and advice book along with a ton of plays, covering just about every variation on how they might be defended and how to adjust. It's pricey but it is meaty, over a hundred pages. The Weekend Warrior The Weekend Warrior is a good source for flag football information, including finding a league, getting information about tournaments, and viewing some free plays. FlagFootballX.com FlagFootballX.com's tag line is "The Ultimate Source for Everything Flag Football." It has league listings for 7 states and tournaments from all over the western half of the U.S. You can list yourself as a Free Agent and connect with teams across the country. The site also sells playbooks for $14.99. Triangle Area Flag Football League (TAFFL) North Carolina's Premier Flag Football Authority. Since 2003, the Raleigh, NC league has been called the 'NFL of Flag Football' and offers adult male, coed, and youth versions of the game. TAFFL also hosts the TAFFL Tournament Series featuring teams from across the Southeast. Visit www.tafflflagfootball.com, www.tafflcoed.com, or www.tafflyouth.com for more information. R.F.L. 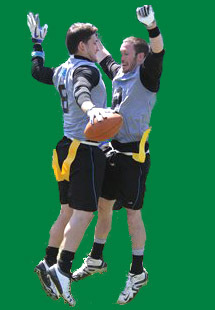 8-Man Flag Football Founded in 2000 by current league director, Troy Reed, for the Columbus and Grove City area in Ohio. The league is dedicated to working with both youth and adults together while playing the recreational sport of flag football. We believe that we can make an impact in the community by empowering individuals from all economic backgrounds and ages to work together as a team, persevere despite strong opponents, and develop strong social skills that promote good sportsmanship. Look here for information about upcoming and current leagues in play throughout the Columbus and Grove City Area in Ohio. Texas Flag Football Association This is an 8 man, non-contact, adult league, founded in 1994. For information, please contact Andy Gonzalez, Director at (210) 734-0374. In this site you will find team standings, game scores, and information on upcoming events for San Antonio and Texas. Long Island Sports League Flag Football This is the site to visit for all information regarding the L.I.S.L. 's Fall 1998 Season. In the future, this site will include weekly standings, game results, Words from the Commissioner, complete rules, and the LISL Hall of Fame. Beach Cities Sports Flag Football Beach Cities Sports Flag Football is a league created by the community, for the community with goals to teach the game of football in a fast-paced, competitive, but non-contact environment and have a good time doing it. The league covers Manhattan Beach, Redondo Beach, Hermosa Beach and South Bay, California. Maximus Sports Maximus Sports offers leagues for all ages and genders in the Oregon area. They also offer advice on starting new leagues and custom merchandise at an affordable rate. Maximus Sports covers local amateur athletic leagues, tournaments, sports camps, clinics, special events, lessons/instruction, youth development programs, corporate outings, sporting goods, custom uniforms, athletic/corporate apparel and more! NOVA Youth Flag Football League NOVA Youth Flag Football League -- The largest NFL Flag sponsored flag football league in the Ashburn/Sterling and Northern Virginia region. Fixyourbody.com Fixyourbody.com is based in Portland, Oregon and provides Injury Solution & Prevention packages for Sports Injuries and Back Pain delivered via E-mail in still-frame or video images. We have helped many save time and costly medical bills while getting back to the playing field quickly and pain-free. Our packages our designed by a medically licensed phyical therapist and meets all 9 standards of the US Department of Health & Human Services for online health. 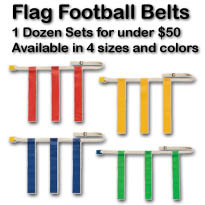 Special offer for The B-Man's Flag Football page visitors: a Discount Identification Number - 1409 (unlimited orders) - for $2 off of our Injury Solution Packages.